While some chronic diseases are perceived as an inevitable part of the aging process, the accrued consequences of poor lifestyle habits, such as inactivity, chronic stress, unhealthy diet and smoking, actually begin to manifest in late middle age. There’s no doubt that quality of life is significantly reduced when one is suffering with a chronic disease. Diseases, including diabetes, heart disease, arthritis and other health conditions may be accepted as just a part of life, yet with healthy choices the onset of disease can be delayed or avoided altogether. Given the option of a long healthy life or a shorter unhealthy one, not many would choose the latter. Obvious physical changes like thinning or graying hair or loss of skin elasticity, as well as reduced sensory abilities may be unavoidable, but those who are excessively overweight or sedentary can take steps to help ensure that senior years are good years. What does it mean to age healthfully? Perhaps it comes down to a sense of pride and self-worth that results from caring for and about your physical health and mental wellness. Opportunities abound for one to support all aspects of health at any age. A proactive approach, that includes the following actions that slow physical and mental aging, can ensure improved quality of life in later years. Maintaining a basic level of fitness can help ward off mobility issues and support muscle strength, coordination and balance, thereby reducing the risk of falls. Participating in mentally challenging activities supports and maintains healthy cognitive function. Taking steps to reduce the detrimental effects of stress on the body is critical, as there is a strong correlation between chronic stress and premature aging. Per the National Institutes of Health (NIH), healthy aging is influenced by improved diet and increased physical activity, as well as other identifiable actions that help manage risk factors for disease development. Ideally, consuming a nutritionally balanced diet should begin in childhood and continue into adulthood, as nutrition plays a serious role in determining the health of people of all ages. For seniors, good nutrition can help delay or reduce disease risk. A nutritionally unbalanced diet is often associated with diabetes, as well as increased risk of developing coronary heart disease. While nutritional requirements change as a body ages, it’s never too late to improve dietary habits. Healthy eaters with the highest intake of foods like whole grain cereal, fruit, beans, legumes and vegetables and the lowest intake of highly refined processed foods, fast foods and sugary drinks, as well as red and processed meats, have the smallest gains in waist circumference and increased weight as they age. Consuming high-fiber and fermented foods supports a healthy gut ecology, which in turn supports healthy digestion and absorption of nutrients, as well as healthy immune and inflammatory responses. Research is currently focused on the relationship between physical problems and micronutrient deficiency. Low consumption of fruits and vegetables is associated with heightened risk of skeletal muscle decline in older persons. Low concentration of vitamin E is correlated with a decline in physical function in senior women, while low vitamin D intake is associated with poor physical performance. A healthy, balanced whole food diet, as well as supplementation when indicated, can help support the healthy function of muscles, bones and organs, as well as maintain strength and mobility throughout life. Love it or hate it, physical activity is considered a cornerstone of healthy aging. 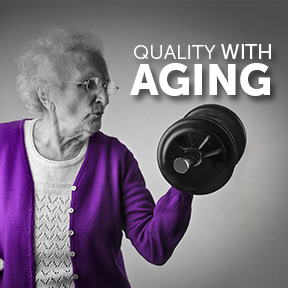 Scientific evidence has shown that those who exercise not only live longer, but live healthier. Staying physically active throughout life supports independent living, strengthens bones, builds muscles and helps keep the body limber, while reducing the risk of disease development. Individuals with chronic stress, arthritis, high blood pressure and diabetes can all benefit from regular exercise. Under a health practitioner’s supervision, those with heart disease may improve heart function with appropriate exercise. Evidence suggests that those who begin exercising in their 60’s and 70’s can also experience improved heart function and decreased risk of coronary events, as well as improved stamina, and lung and circulatory function. A generally active lifestyle incorporating daily movement, along with short but frequent activity can aid stress reduction, weight management and healthy mood. Contrary to what we have always heard, thinner is not always healthier. Although many health issues are connected to obesity, including high blood pressure, heart disease, sleep apnea, osteoarthritis, and diabetes, data points to body composition, or the fat-to-muscle ratio, as well as the location of fat on the body to an increased risk of mortality. Body fat distribution, specifically waist-to-hip ratio is associated with a higher risk of metabolic syndrome, diabetes, heart disease and certain cancers. While there are no set ranges for ideal weight for seniors, carrying a slightly higher body mass index (BMI), between 25 and 27, may be more beneficial for those over age 65, and less harmful than becoming underweight. A study published in the Archives of Gerontology and Geriatrics found that older adults with BMIs over 30 did not experience a decline in activities of daily living. However, this is not an endorsement for ignoring excess weight gain but stresses the negative impact of low body weight on the management of chronic illness. Studies have shown that older adults who participate in meaningful activities, such as volunteering, report feeling happier and healthier. Research has also found that those who are involved in hobbies, as well as social and leisure activities may reduce their risk of cognitive decline. As well, older adults who participated in enjoyable productive activities, such as reading, gardening and cooking, have been shown to have longer lifespans than those who did not participate in the enjoyment of life and all its offerings. Chaga by Organic Mushroom Nutrition: Highly revered for its anti-aging properties, this legendary mushroom offers a broad array of nutrients, including beta-glucans, prebiotics, digestive enzymes, antioxidants, amino acids, proteins, peptides, lectins, polyphenols, flavonoids, selenium and more. Free of gluten, heavy metals and synthetic ingredients. Fermented, Non-GMO, kosher vegan formulation. Longevity Nutrients by Pure Encapsulations®: This complete, nutrient-rich, hypoallergenic formula provides highly bioavailable activated vitamins, minerals, antioxidants, botanicals and trace elements in support of healthy aging, as well as cardiovascular, cognitive, blood vessel, eye and cellular health. Gluten free, Non-GMO formulation. Essential Male Pack by Douglas Laboratories®: Formulated for men of all ages, this product provides optimal daily nutritional support in convenient individual packs. Ingredients include vitamins, minerals, antioxidants, omega-3 essential fatty acids and prostate health supportive nutrients. Free of yeast, gluten, soy protein, milk/dairy, corn, sodium, starch and artificial coloring, preservatives and flavoring. Essential Female Pack by Douglas Laboratories®: These multi-nutrient convenience packs are specially formulated to meet the daily nutritional needs of females of all ages. Packs include essential vitamins, minerals, antioxidants, bone supportive nutrients, probiotics and essential fatty acids in support of women’s overall health and wellness. Antioxidant Resilience® by Progressive Laboratories®: This antioxidant formula provides a blend of clinically studied ingredients including glutathione and SOD, as well as a proprietary blend of high ORAC superfoods and botanicals in support of free radical damage protection, detoxification and immune fortification. This entry was posted in Home and tagged Aging, Antioxidant Resilience® by Progressive Laboratories, Chaga by Organic Mushroom Nutrition, Essential Female Pack by Douglas Laboratories, Essential Male Pack by Douglas Laboratories, Longevity Nutrients by Pure Encapsulations, Maintaining Life Quality with Aging. Bookmark the permalink.